Jun 19 2013 (IPS) - Nigeria -one of Africa’s most populous states and a major oil producer – learned hard lessons about under-investing in food security for its people: malnutrition went up; so did prices and corruption in the voucher system for farming inputs. That is all in the past now, says Nigeria’s Minister of Agriculture and Rural Development, Akinwumi Adesina, who credits political support for helping Nigeria halve the number of hungry people in the last two years. 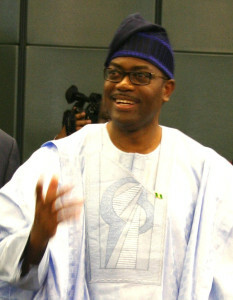 The country was one of the 38 nations recently awarded by the Food and Agriculture Organisation (FAO) for meeting Millennium Development Goal One on reducing hunger and extreme poverty, from 19.3 percent in 1990-1992 to 8.5 percent today, according to Adesina, who became agriculture minister in 2011. BB: So what is your secret for turning the tide? AA: We are using quite a lot of private sector investments to drive agriculture. Because at the end of the day, if you are a farmer and you have a lot of money, you cannot only buy supplementary food that you need but can also invest in housing, in sanitation and better nutrition for your kids. BB: Political will comes with financial resources. Has Nigeria invested adequately in its agricultural productivity? We made one fundamental paradigm shift on agriculture. Agriculture is not just a quantum of public sector funds that you put into agriculture, but agriculture is a business. In the last 18 months, we have been able to leverage about 8 billion dollars of private sector investment commitments in this. We are not looking at just increasing public finance, but also looking at leveraging a lot of private sector into agriculture, because agriculture is not a development programme. BB: What challenges have you faced? As minister of agriculture, my goal is to make sure that we are a net exporter of food. I am not satisfied that Nigeria has been importing food for a long time. We are already turning that around. We have produced 1.9 million metric tonne of rice in just one year. That is about 55 percent of what we need to be self-sufficient in rice by 2015. The secret: making sure that farmers get the inputs. The challenge remains making sure that all farmers today get inputs and finance at affordable interest rates. Our President has approved that we recapitalise our Bank of Agriculture. We are using our own funds, not development funds, to leverage 3,5 billion dollars off the balance sheet of our banks for agriculture. Another thing is infrastructure, whether it is rural roads or making sure our irrigation facilities are well done. BB: You launched a mobile facility for farmers to access vouchers. One of the reasons for this was to curb corruption. What impact has this made? For 40 years fertilisers in Nigeria were bought and sold by government. As that happened, no more that 11 percent of the farmers were actually getting fertilizers and sometimes they were getting sand as fertiliser. This was creating a lot of disincentives for farmers. At the start of his administration, and with Mr. President’s support, it actually took 90 days to end corruption of 40 years. We decided to reach our farmers directly with inputs and that is why we did the electronic wallet: farmers could get their inputs on time and we could target them. Some people said farmers will not be able to use the mobile phones, but the fact that you do not speak English does not mean you are illiterate. Out of the 4.9 million transactions that were done by mobile phone last year, 2.2 million were done in Hausa and 1.8 million of them were actually done in the Pidgin language. The impact has been massive. We cut out the corruption and cut out the middle men and saved government money. We saved 29 billion Naira [about 180 million dollars] just last year and that is money I would have [otherwise] signed away [to input suppliers] as Agriculture Minister.